This should really be more of a month of June wrap-up since I’ve been MIA for the past week and a half! I swear, it never fails. The moment I get back into the groove of things, and I have everything all planned and mapped out, something happens and our world is turned upside down. This something was very, very scary, and it was very hard emotionally to deal with, but things are finally looking up and the family is out of the weeds now. Life is once again progressing beautifully. I can’t remember if I told y’all this before or not, but my sister-in-law was also pregnant and was 3 months ahead of me with their third child, also a little boy. We were so excited to be pregnant together, and I was also thrilled b/c I received an entire wardrobe of free maternity clothes b/c the babies would be born in different seasons, but also because Owen would be well stocked with hand me downs as well. Well, at exactly 1:58am the day after my birthday, I received a phone call from my mother telling me that my brother was rushing to the hospital b/c my SIL was in labor…4 weeks early. By 2:17 am, my nephew Samuel Stokes had been born. Yes, you read that right. She was in labor for less than 30 minutes. My SIL got to hold baby Sam for just a moment before he was taken from her, tested, and then rushed to a different hospital over 15 minutes away because of complications with his lungs. The good news is that he was rushed to one of the best hospitals in the country to handle babies in crisis. The bad news is that my poor SIL was left alone in the hospital without her newborn in her arms because my brother had to rush to the other hospital with the baby. My mother called me again at 6:47am and told me I needed to come home back to Charleston. She told me that Sam was in the NICU, but things seemed promising and to go ahead and get in the car now. Mind you, we had an unexpected 6 hour drive ahead of us where my mother knew I’d be freaking out, so my family didn’t really go into too much detail before we got home. Long story short, baby Sam was born with pneumonia and underdeveloped lungs, and he has been fighting to get well ever since. The first four days of his hospital stay were full of terror, heartache, confusion, and longing, and my family banded together to support our loved ones who were hurting the most. Sam is still in the hospital, but I am happy to report that he has been moved out of the NICU and into the Level 2 nursery. From my brother’s last update, baby Sam will likely be able to come home very, very soon! Thanks so much for your patience, and I appreciate all of your love and support. I will be hosting my first giveaway later this week to thank you all for being so amazingly awesome! Health Warrior Chia Bar Giveaway! Next PostNext Health Warrior Chia Bar Giveaway! Congradulations to your family on the newest addition. I am so happy he is doing well. He must have been taken to the neo-natal center at MUSC. I had a nephew spend the first few days of his life there. They are amazing there. They are truely blessed. As a med student, I both love and hate the NICU. So many miracles happen there, and the nurses, docs, and other staff are such a blessing to so many families. On the other hand, a lot of heartache happens there, too. I’m so very happy that your family was blessed to be in the first category. Best wishes to your brother, SIL, and whole family! Thanks, girl! He is absolutely beautiful, and I can’t wait to get my hands on his! 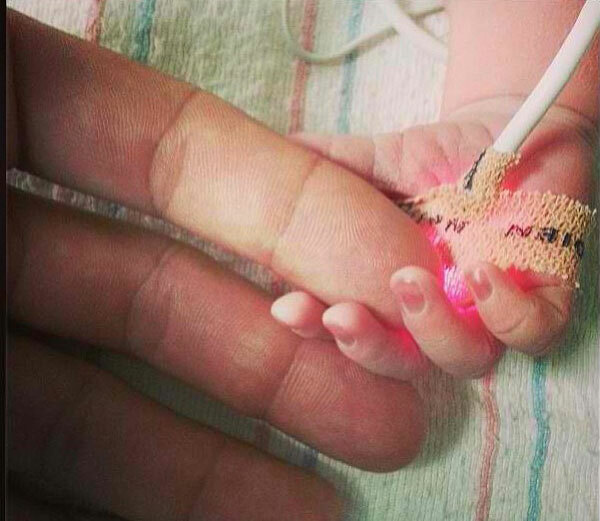 Some of the babies in the NICU were so, so, so tiny too. I give major props to the nurses, docs, and other staff who have to deal with that on a daily basis. I really don’t have the heart for it!